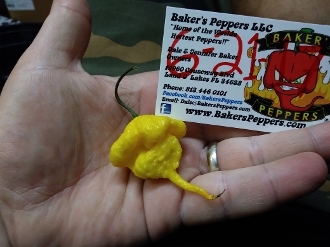 We now have Yellow Reaper Seeds! It is the yellow variety of the Reaper. Packs of seeds come 20+ to a pack and are assured to burn! It will be roughly 170 days to harvest and mature from green to a fiery yellow color. This beautiful nuclear hot pepper is amazing in fruity salsas and sweet hot sauces. Order yours today!